Located only minutes from downtown Portland, Oregon, this Vancouver hotel is surrounded by a variety of attractions and recreational activities and provides comfortable accommodations and modern amenities. Within walking distance of the Hilton Vancouver Washington, guests will discover unique shopping centers, art galleries and entertainment options. The scenic trails of Gifford Pinchot National Forest as well as the historic Cedar Creek Grist Mill and Esther Short Park are also located nearby. The Vancouver Washington Hilton is an environmentally-friendly hotel that was designed with comfort in mind. Guests at the hotel will appreciate the state-of-the-art fitness center as well as the spacious meeting facilities. The hotel also features wireless internet access and on-site dining options. This all-suite hotel is in Vancouver, next to the Columbia River. Each suite features a fully equipped kitchen, separate sitting area and free Wi-Fi. Homewood Suites by Hilton Vancouver/Portland features an outdoor swimming pool and a gym. Guests can use the tennis court or the laundry facilities. A hot breakfast is served every morning at the Vancouver Homewood Suites. A free reception with a light meal and beverages is offered Monday through Thursday evenings. Fort Vancouver is a 5-minute drive from the Homewood Suites. AT&T is 5 miles away. Within driving distance of Portland, Oregon and providing free shuttles to Portland International Airport, this Vancouver, Washington hotel features spacious all-suite accommodations with fully-equipped kitchens. Start the day at the Staybridge Suites Vancouver Portland Metro by preparing a home-cooked meal with in-room stoves, microwaves and dishware. Enjoy the outdoor swimming pool and 24-hour fitness center or take advantage of the on-site barbecue facilities. Browse for snacks at the convenience store, relax in the outdoor whirlpool or enjoy the sports court, all available on-site at the Vancouver Portland Metro Staybridge Suites. With free shuttles within a 5 mile radius, the Vancouver Mall, Fort Vancouver and Mt. View Ice Arena are easily accessible. The Portland Expo Center and the Oregon Zoo are also within driving distance. Featuring a 32-inch flat-screen TV, a mini-refrigerator and a microwave in each guestroom, this Vancouver, Washington hotel is only minutes from the Fort Vancouver National Historic Site. Guests can enjoy the free hot breakfast served daily at the Holiday Inn Express Hotel & Suites Vancouver Mall-Portland Area. Free wired and wireless high-speed internet access is available in each guestroom. Guests can relax in the indoor pool and whirlpool or work out in the 24-hour fitness center. Within driving distance of the Vancouver Mall-Portland Area Holiday Inn Express, it is possible to discover the Multnomah Falls at the Columbia River Gorge National Scenic Area. Washington State University and Portland International Airport are also easily accessible. This Vancouver hotel is located off I-205 and offers free shuttle services to Portland International Airport. The hotel offers a hot breakfast, and each suite has a fully equipped kitchen. Suites at this North Vancouver Residence Inn include a fireplace, living area and dining area. A 32-inch flat-screen TV and in-room movies are also offered. Residence Inn by Marriott Portland North Vancouver features an outdoor pool and a spacious fitness center with an outdoor sports court. A 24-hour convenience store is also featured. The Westfield Shopping Mall is within walking distance of the Portland Residence Inn in Vancouver. The Pearson Air Museum is situated 3.8 miles away. This Vancouver hotel is a 15 minute drive from Portland International Airport. A gym and tanning bed are also available on site. Comfort Suites Vancouver Mall offers a microwave and refrigerator in every spacious suite. Suites are also equipped with MP3 docking stations and free Wi-Fi. Guests can use the indoor pool or the jacuzzi at the Vancouver Mall Comfort Suites. Washington State University Vancouver is a 10 minute drive from the Comfort Suites in Vancouver. Royal Oaks Country Club is one mile away. This Vancouver, Washington hotel features an indoor heated pool and free Wi-Fi. Guest rooms at the Days Inn and Suites Vancouver include cable TV with HBO and a coffee maker. Select rooms provide a microwave and a refrigerator. The Vancouver Days Inn and Suites is 15 miles from the Washington Park Zoo and 25 miles from the Columbia River Gorge. Fort Vancouver is 6 miles from the hotel. This Vancouver hotel is only a 15-minute drive from downtown Portland and the Oregon Convention Center. It offers an on-site restaurant, seasonal outdoor pool and flat-screen TVs in all rooms. Comfort Inn Vancouver’s guest rooms are equipped with a microwave and refrigerator. Each room is also furnished with a work desk and a lounge chair. Vancouver Comfort Inn and Suites features a gym and a sauna. A continental breakfast with hot waffles is served every morning. The Fort Vancouver National Historic Site is less than a 5-minute drive from the Comfort Inn and the Clark County Fairgrounds are 10-minute drive away. The Historic Marshall House is a 10-minute walk away. This hotel offers free breakfast, a well-equipped fitness center and an indoor pool. It provides complimentary shuttle service to Portland Airport. Fort Vancouver is a 20 minute drive away. All rooms at SpringHill Suites Vancouver have deluxe bedding which includes a pull-out sofa bed, feather pillows and thick mattresses. Each one has a microwave and basic kitchenware. Accommodations are equipped with a 32-inch flat-screen cable TV. A plug-in panel is provided for each room. Guests can use the on-site hot tub or enjoy outdoor activities at the nearby nature trails or hiking spots. The hotel provides free shuttle service to nearby locations. Pearson Air Museum is a 20 minute drive from SpringHill Suites Vancouver Columbia Tech Center. Lacamas Lake is 7.3 miles away. The charming Heathman Lodge in Vancouver, Washington offers a rustic feel while providing modern amenities such as free Wi-Fi and cable TVs. 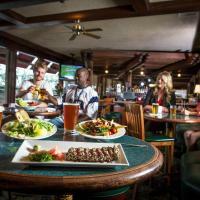 On-site dining is available at Hudson’s Bar & Grill. A work desk and sitting area are provided in all rooms at this hotel. Each room also includes a microwave, coffee maker and refrigerator. Guests of the Heathman Lodge can enjoy the indoor pool and hot tub or use the on-site gym. A 24-hour business center is available for use as well. Hudson's Bar & Grill offers traditional northwest American cuisine all day. Hudson’s has a natural mountain feel with trendy features including a large slate fireplace and high ceilings. Fort Vancouver National Historic Site is a 13 minute drive from the Heathman Lodge. Macy's Westfield Vancouver Mall is half a mile away and Portland International Airport is 11.5 miles away. Under a mile from Washington State University and Legacy Hospital, this Vancouver hotel features free Wi-Fi. A continental breakfast is served every morning. Rooms at Gateway Inn Express come equipped with a cable TV with premium channels. The private bathroom includes a hairdryer. The Gateway Inn Express has a fitness center, as well as an indoor pool and hot tub. There is a business center with copy, fax, and printing services available. Complimentary newspapers are provided in the morning. The Vancouver Mall is 8 miles away. Portland International Airport is a 15-minute drive away. This Vancouver motel offers rooms with a simple design that include a cable TV. Free Wi-Fi is available throughout the property and Westfield Vancouver Mall is 4.3 miles away. The Motel 6 Vancouver offers free morning coffee in the lobby and the hotel staff is available around the clock at the 24-hour front desk. A meeting room and laundry facilities are on site. Both the Portland International Airport and Fort Vancouver National Historic Site and Museum are within a 15-minute drive of the Vancouver Motel 6 and Colwood Golf Course is 6.5 miles away. Portland International Airport is 2.9 miles from this Vancouver, Washington hotel. An indoor pool, a small gym and guest rooms with free Wi-Fi are available at the hotel. Each room at the Best Western Inn of Vancouver includes light wood furniture and carpeted floors. Cable TV with the HBO channel, a refrigerator and microwave are also provided. Guests can find drink and snack vending machines at the hotel. The hotel also offers laundry facilities and free parking. Fort Vancouver National Historic Site is 5.2 miles from the hotel. Vancouver Best Western Inn is 3 miles from the Fairway Village Golf Course. Located 2 blocks from the Southwest Washington Convention Center and 1.5 miles from Hayden Island, this hotel offers guests a continental breakfast and classically decorated rooms equipped with free Wi-Fi. Each room at the Vancouver Econo Lodge includes hardwood furniture and satellite TV. A refrigerator, microwave, and coffee maker are provided. Portland International Speedway is a 10-minute drive from Econo Lodge Vancouver, just across the Interstate Bridge. Fort Vancouver is 1 mile from the property. Laundry facilities are available at this pet-friendly hotel and free parking is located on site. Only 10 miles from Portland International Airport just off of I-205, this hotel across from the Vancouver Mall features free Wi-Fi and includes a daily continental breakfast for all guests. A cable TV is provided in each room at Howard Johnson Inn and Suites. A work desk is provided. Microwaves and refrigerators are included in select rooms. A heated indoor pool and hot tub are available for guest relaxation. A 24-hour front desk welcomes guests to Howard Johnson Inn and Suites. A business center and guest laundromat are provided. Pearson Air Museum is a 10-minute drive away. Central Portland is a 20-minute drive from Howard Johnson Inn and Suites. Portland International Airport is 10 minutes' drive from this Vancouver, Washington motel. Satellite TV with Showtime and free Wi-Fi are available in every room. A microwave and fridge are provided in the traditionally decorated rooms at Guest House Motel. Guests can make free local calls and free long distance calls to the United States and Canada. Guest House Motel Vancouver offers fax services and has a vending machine with drinks. Guests can enjoy free parking during their stay. Mountain View Ice Arena is 6 minutes' drive from the motel. Green Mountain Golf Course is 7 miles away and Interstate 205 is less than 1 mile from the motel. Located off Interstate 205, this Vancouver, Washington hotel offers a daily hot breakfast and rooms with free Wi-Fi and a cable TV. It is adjacent to Vancouver Mall Shopping Center. A microwave, fridge and coffee maker are provided in all rooms at the Best Western PLUS Vancouver Mall Hotel. Each warmly decorated room includes a spacious work desk. Free access to the indoor pool, hot tub and sauna is offered to all guests. A fitness room and convenience shop are both on site. Green Mountain Golf Course is just 7.3 miles from the Vancouver Mall Best Western PLUS Hotel. The Portland International Airport is a 15-minute drive away. Located a 5-minute drive from Discovery Trail and 14 miles from Downtown Portland, the motel offers easy access to nearby restaurants. Bright and open rooms include cable TV and free Wi-Fi. Salmon Creek Inn houses simply furnished rooms feature carpeted floors and work desks. Premium TV channels and wake up services available. Motel provides a business center with photocopy and fax access. Dry cleaning services are available. Clark County Amphitheatre is a 7-minute drive away. Shopping at the Vancouver Mall is 8.4 miles from the Inn at Salmon Creek. This Vancouver area hotel features a continental breakfast and free Wi-Fi. Guest rooms include a flat-screen satellite TV. Washington State University Vancouver is 2 miles away. A microwave and small fridge are featured in all rooms at Choice Inn and Suites. Tea and coffee-making facilities are provided. Choice Inn and Suites offers an indoor pool and a fitness centre with a hot tub. Vending machines are also provided for guest convenience. Interstate 5 is just 5 minutes' drive away. Legacy Salmon Creek Medical Center is less than 10 minutes’ walk from the property and Vancouver Lake is 25 minutes’ drive. Clark County Fairgrounds is less than 10 minutes’ drive away. A 5-minute walk from Hazeldell Mall, this Vancouver, Washington motel has a 24-hour front desk. All rooms feature a private bathroom. Free guest parking is available. A TV and a telephone are provided in each air-conditioned guest room at Value Motel. Fax and photocopying services are available to guests of Motel Value. Vending machines with drinks are available. Downtown Vancouver is a 5-minute drive away. Portland International Airport is 15 miles from Vancouver Value Motel.